Are you standing in the store with a light bulb package in your hand, wondering how am I supposed to know how bright this will be? Will it be white light? Will it be efficient? What is this nutrition-label looking thing on the back of the packaging? What does all this mean? Relax, Wolfers is here to help break it down for you. The new Lighting Facts Label, shown here, provides a summary of a light’s performance data. Sponsored by the Department of Energy, it is formatted in the style of a “nutrition facts label” and protects consumers from exaggerated claims, ensuring a satisfactory buying experience. Let’s break down the elements, as shown on the label above. LUMENS measures LIGHT OUTPUT. The higher the number, the more light is emitted, therefore the brighter the light. Watts measures ENERGY required to light the product. The lower the wattage, the less energy used. Lumens per Watt measures EFFICIENCY. The higher the number, the more efficient the product. 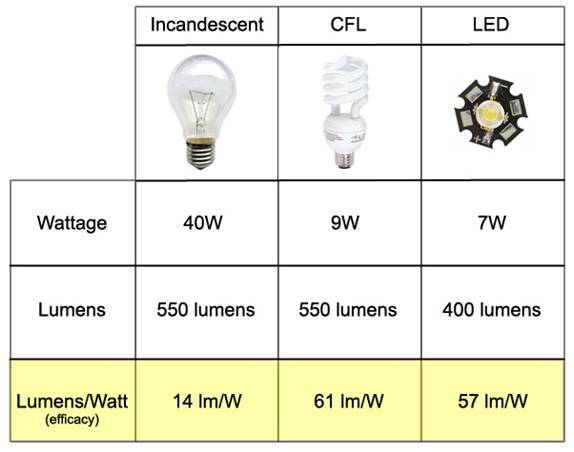 This chart compares an incandescent, fluorescent, and LED light source. Color Rendering Index (CRI) measures COLOR ACCURACY, or, in other words, how well a light source renders the colors of objects, materials, and skin tones. CRI is based on a scale from 1-100 (100 being the best). Therefore, a low CRI will make colors look duller, whereas a higher CRI (80 or above) makes colors appear more vibrant and is more preferable for residential applications. Correlated Color Temperature (CCT) measures LIGHT COLOR. Colors with lower Kelvin temperatures (around 2700-3500K) are warmer tones, usually in red/yellow spectrum, whereas colors with higher Kelvin temperatures (3600-5500K) are cooler tones, usually in the blue/purple spectrum. When designing a space, it’s important to keep the CCT the same in all light sources. For more information on the Lighting Facts Label, click here or contact us to speak with a Wolfers lighting expert. How is your cooking? Your skills might be even better once you brighten up your kitchen with under-cabinet lighting! At Wolfers, we’ve seen more homeowners come to our showrooms in search of under-cabinet lighting than ever before. While you may think purchasing lights online will suffice, we recommend viewing under-cabinets in person, allowing you to see the lights up close and focus on how the different sources will look against various surfaces and countertops. If you choose to install halogen bulbs, do not keep perishables in the cabinets above, as these lights generate a bit of heat and may cause perishable food, like chocolate, to melt. Generally, homeowners utilize under-cabinet lights for task lighting. About 70% of under-cabinets are installed in kitchens, typically above countertops, to improve visibility for tasks like cooking and reading recipes. But they also can be used in laundry rooms, above desks, or even in bookcases – any surface that requires bright and focused light. LED Lighting Tip: If a product has a warm color temperature of 3000 but a CRI (Color Rendering Index) of 65, this light will appear as a blue color, due to the low CRI. Typically, homeowners look for a light source that has a high CRI and a warm color temperature. Many homeowners choose under-cabinets based on color tone, efficiency, and overall appearance. Nowadays, LED under-cabinet lights are more popular than ever. Not only are LEDs more efficient (lasting roughly 15-20 years, compared to halogen or fluorescent bulbs lasting only six months), but they also offer the bright white light required for task lighting. Changing under-cabinet bulbs is not always easy – bending underneath tight spaces and between countertops can be exhausting. Homeowners often find not having to change bulbs frequently as a huge advantage to choosing LED lights. New Tech Lighting Product: Homeowners often find certain under-cabinet light sources, such as LEDs and halogens, mirror their image on their polished countertops. To avoid this, Tech Lighting found an innovative solution: the Unilume. The Unilume is a LED light source but uniquely uses yellow phosphors. This new product offers the long linear light you can get from a fluorescent but in a warm color tone. The bulb has a lifetime of 50,000 hours, which equates to about 30 or 40 years. The Unilume is now available for purchase at Wolfers. Visit one of our showrooms today for the latest in under-cabinet and LED lighting.